Xi says that now is a “period of strategic opportunity,” while military officials set the objective of winning “informatized local wars.” The word “informatize” is similar to the word “industrialize,” means that all aspects of warfare must be computerized. The large digital demand leads to theft for the sake of militaristic expansion, while the PLA covertly expands its power through foreign trade. The PLA is undergoing the largest structural reform in its history and attempting to create a joint operation force. A joint operation force is one that bridges divisions between the army, navy, and air forces so that they can better work in unison. The Chinese Communist Party’s (CCP) defense spending, which is likely higher than publicly stated, has increased over the years while GDP growth has slowed. The PLA Air Force has begun developing a stealth bomber, along with UAVs, including long-range, and cargo UAVs. Both the PLA Navy and Rocket Force are steadily expanding beyond the range of the mainland. The Navy is expanding for overseas operations, and is currently building two new aircraft carriers to add to its existing Soviet-built carrier that it purchased from the Ukraine. Advances in Chinese rocketry has given them intercontinental ballistic missiles that can reach much of the United States. “Many of China’s missile programs are comparable to other top-tier producers,” the report says. However, armaments and aviation technology still lag behind. “The PLA continues to strengthen its military space capabilities despite its public stance against the militarization of space,” the report says. This includes a space station that may begin assembly in 2019, and potentially militarizing the moon. Though the Chinese regime always puts up a politically correct appearance, it lies constantly about its behavior. In a 2015 agreement, the CCP said it would stop cyber espionage against the United States. However, “computer systems around the world, including those owned by the U.S. Government, continued to be targeted by China-based intrusions through 2017. These and past intrusions focused on accessing networks and extracting information,” the report said. One recent example of foreign direct investment may be linked to a recent Chinese professor’s suicide. China-sponsored investment was revealed in a report (pdf) about Zhang Shouchang’s Silicon Valley company Digital Horizon Capital. 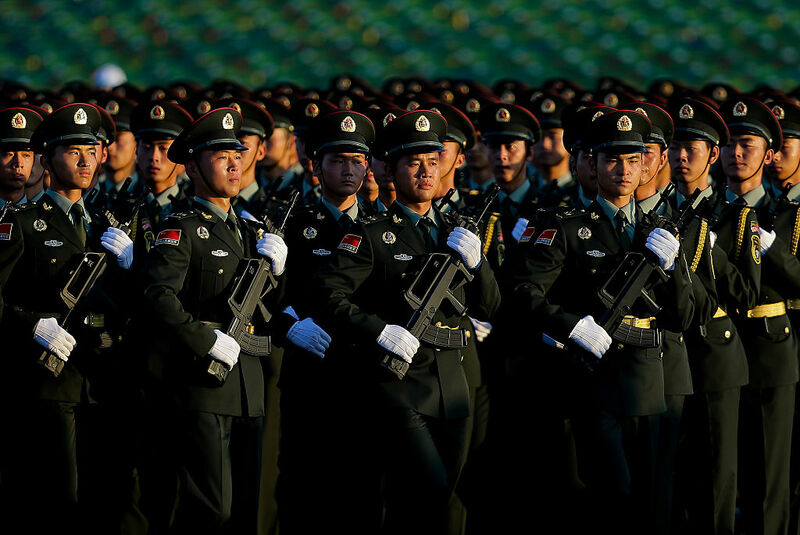 “China very likely uses its intelligence services and other illicit approaches to obtain key national security and export-restricted technologies, controlled equipment, and other materials unobtainable through other means,” the report says. “A citizen of China who is also a lawful permanent resident of the United States pled guilty in Federal district court to charges related to theft of numerous sensitive military program documents.” The documents were about the engines used in the American F-22 and F-35 fighter jets. China’s first target will be Taiwan, which it raegrsd as a renegade province. “Taiwan’s 2017 National Defense Report cited concerns that increased PLA military activity near Taiwan pose an ‘enormous threat to security in the Taiwan Strait,’” the report said. China continued to pressure Taiwan directly and indirectly. After Taiwanese President Tsai Ing-Wen, who supports independence for Taiwan, came to power in 2016, five countries have cut ties with the island. Several, including Panama, El Salvador, and the Dominican Republic now have diplomatic relations with China instead. China also has held invasion style military drills, one including a mock-up of the office of the Taiwanese President. If a successful attack falls on Taiwan, it may be just the first in a series of offensives. This entry was posted in Asia, Axis Powers, Business & Economics, China, Communism, Cyberwarfare, Espionage, Military, Military Technology, National Security & Terrorism, Nuclear Weapons & Proliferation, PLA, PLA Navy, Politics, Soviet Union, Taiwan, Ukraine, USA and tagged Asia, Beijing, Belt and Road, Belt and Road Initiative, CCP, China, Chinese Communist Party, Chinese militaristic expansion, Chinese rocketry, Communism, cyberwarfare, Department of Defense, Digital Horizon Capital, Electronic Warfare, Espionage, F-22, F-35, GDP, informatization, informatized local wars, joint operation force, National Security & Terrorism, nuclear weapons & prolifferation, people's liberation army, People's Liberation Army Air Force, People's Liberation Army Navy, PLA, PLA Rocket Force, PLAAF, PLAN, PLARF, psychological warfare, Report Details China’s ‘Informatized’ Military Expansion, russia, sensitive military program documents, Taiwan, Tsai Ing Wen, ukraine, United States, Xi Jinping, Zhang Shouchang. Bookmark the permalink.